Education and technology made a good pair. Walking at the same pace they are building a better and smarter future. Augmented reality let students visit Antarctic and see the Amazon Jungle without a necessity to leave a classroom. Artificial intelligence helps teachers to save their time by an automated grading system. What the most important this year is that the newest technology makes education affordable for everybody. It should be noted, that there is another side in the development of education, which reminds of Renaissance's humanism. Each student is treated with an individual approach and teachers value strength and weaknesses of a student. Educators create a perfect environment for everybody instead of using the same pattern for everyone. Future bright and it's here. 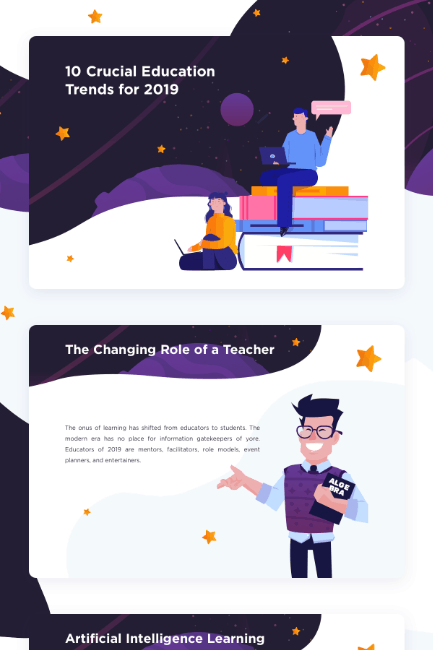 Look at the most important education trends of 2019 in the infographic created by PaperHelp, a team of enthusiasts who works on improving the methods of teaching and blogs about EdTech.